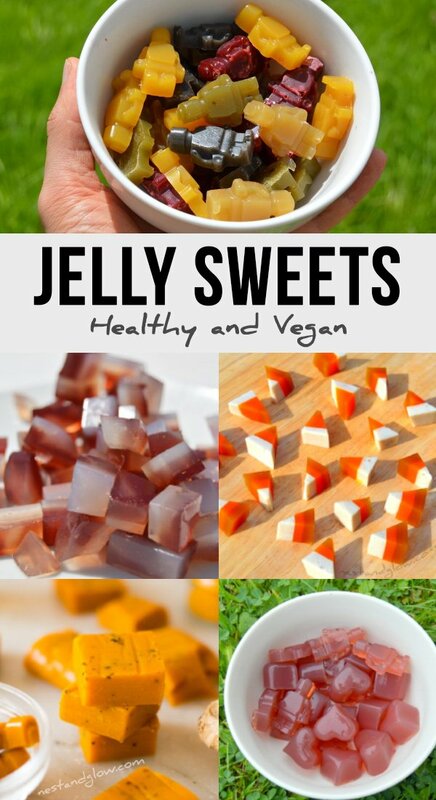 Easy to make healthy jelly sweets made without refined sugar or gelatine. These recipes are all vegan, vegetarian, paleo and suitable for a whole foods plant-based diet. The main ingredient for all of these is pure fruit/vegetable juice. They are set using the natural seaweed extract agar agar. These bright and colourful sweets are all made from fresh fruit. Just blend the fresh fruit and push through a sieve. Black sweets were accidentally created by not washing out the bowls in between making plum and kiwi sweets! Agar agar is a natural seaweed extract. Its name comes from the Malay word for the type of algae used to make the extract. In my recipes agar agar powder as always used it is more potent than the flakes or bars. 1 heaped tablespoon is enough to set about 1 cup / 240 ml of liquid. It needs to be gently heated for a few minutes to activate the agar agar then it will set once cool. Always stir the agar agar constantly when simmering to make sure none is lost by sticking to the bottom of the pan. Agar agar is also used to make Nut and Seed Vegan Cheeses like Smoked Cashew Cheese or Sunflower Cheddar Vegan Cheese. View the Healthy Jelly Sweets Video Recipe on YouTube.